There are two types of dental plans available in Florida that are industry standard. These are Dental Insurance and Discount Dental Plans. These both offer savings on dental care, however, over the past decade one of these has emerged as being clearly better than the other. Let’s take a look at the two options available. There was a time, actually around twenty years ago, that dental insurance was the only type of dental plan available. Fortunately, that’s no longer the case. Some dental insurance plans offer decent long term coverage, but they don’t offer immediate dental care coverage, because they do not cover any condition that is pre-existing. This means that if you have a painful tooth ache and need to see a dentist right away, buying an insurance policy will do you no good at all because no insurance company will cover it. You’ll be forced to pay 100% of the costs out of your own pocket. Dental insurance does provide for the cost of most routine dental care, such as fluoride treatments, check-ups, cleanings and such, however, you’ll still have to pay an annual deductible. There have been a few “cheap” dental insurance plans that have popped up on the internet recently that cost as little as $8-10.00 per month. I highly recommend that you look at these very carefully before you buy one. Pay particular attention to the “Exclusions” of the policy. These are things that are NOT covered by the plan. I think you’ll be shocked when you find out how little coverage is actually provided by the plan. You can buy a private policy from a local agency, however, the costs are expensive and the coverage provided by the plans is not always adequate, especially if you have a pre-existing condition. The bottom line is that this type of insurance is expensive and doesn’t provide adequate care, especially since most people wait until they actually have a problem to see a dentist in the first place. This type of dental plan will do these people absolutely no good, at least in the short term. These types of plans offer substantial discounts for joining their network. You simply pay a low annual fee, after which, you may see any dentist within their network of providers and recieve discounts of up to 60% off the usual cost. Here’s an example. This example is taken from the Tampa, Florida area, zip code 33615. There are 14 featured plans for this area, however, as I enter the zip code into the plan finder, the first one being recommended is called “Protective Dental Plan”. There are 303 participating dentists that accept this plan within a 50 mile radius of this zip code, so finding a dentist won’t be a problem at all. In this example we’ll say that you haven’t been able to get to the dentist in quite awhile, therefore, you’ll need an In Depth Check-up, Full Mouth X-rays and an Adult Teeth Cleaning. You may need repairs also, but we’re just using this as an example. The usual cost of an In Depth Check-Up is $67.00, the usual cost of Full Mouth X-rays is $104.00 and the usual cost of an Adult Tooth Cleaning is $75.00. The normal cost of having this three things done would be $246.00. That cost only pays to find out what problems you have. Now you get to pay out some REAL money to get your teeth fixed. 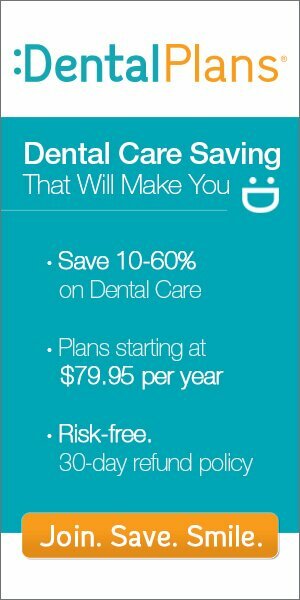 The benefit of having a discount dental plan is that they’re designed to save you money on not just routine care, like the example above, but on major dental care too. Let’s do the example again, assuming that you join the discount plan above before seeing the dentist. In this example, your cost for an In Depth Check-Up will only cost $20.00, a savings of $47.00. Your Full Mouth X-Rays will only cost $50.00, a savings of $54.00. Your Adult Tooth Cleaning will only cost you $35.00, saving you $40.00. The total cost of this example is only $105.00. That’s a total savings of $141.00! If you have a family you can multiply that $141.00 that you saved by the number of family members that you have and you’ll see hundreds, potentially thousands of dollars in savings. The cost of joining the dental plan above is only $99.95 per year for an individual or just $149.95 per year for an entire family. Also, right now you can save an additional 10% off of the cost to join! Simply enter the 4 digit code above when you check out. Don’t put off getting a good >> Florida discount dental plan any longer. Simply enter your zip code in the box above to find a provider in your area and then enter the 4-digit code JE10 to save an additional 10% off when you check out. You can also call us Toll Free at 1-855-214-7725. Do it Today!